A custom made staff we created to a customers specifications. A Crocodile and an African Caracal Cat are wrapped around a clear lexan sphere. The shaft is black walnut and can be broken down into 3 pieces. 20 gemstones of red garnet and blue lapis lazuli adorn the work. Cane measures 5" and breaks down to 20"
African Ceremonial Staff is not available for sale. This is an example of custom, limited-edition design. 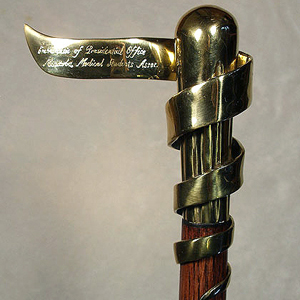 A ceremonial cane designed and created for the Manitoba Medical Students Assoc. To be used at graduation by the faculty of medicine. The design incorporates a stylized Asclepius. The twisting ribbon spirals along the shaft and up the cane head. it is free standing to give it an open movement. Plated in gold with oak shaft. M.M.S.A. Asclepius Cane is not available for sale. This is an example of custom, limited-edition design. A ceremonial cane designed and created for the Manitoba Medical Students Assoc. To be used at graduation by the faculty of medicine. The design incorporates the Medical College faculty crest, the flag of St George, the buffalo, the motto Fiat Lux, and the Asclepius. 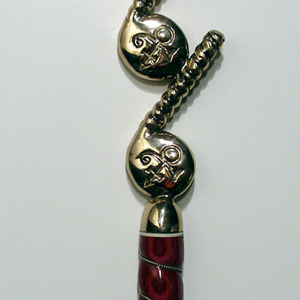 Plated in gold with garnets and red enamel. Shaft is oak. M.M.S.A. Cane is not available for sale. This is an example of custom, limited-edition design. One of two canes we designed and created for the Faculty of Pharmacy at the University of Manitoba. Cane head Has 5 panels each with a different symbol of Pharmacy medicine or Manitoba. 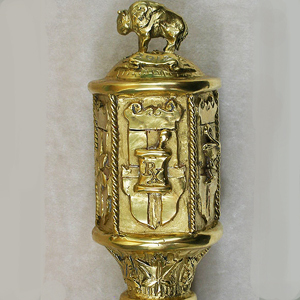 A Bison is on top symbol of the school and Manitoba. Maple leaves of Canada surround the base. Head is solid bronze with gold plating. Shaft is black lacquered maple. Pharmacy Cane is not available for sale. This is an example of custom, limited-edition design. One of two canes we designed and created for the Faculty of Pharmacy at the University of Manitoba. 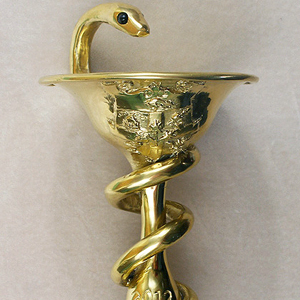 A very unique cane head has the traditional symbol of pharmacy, the cup and snake with the snake spiraling down the cane shaft. 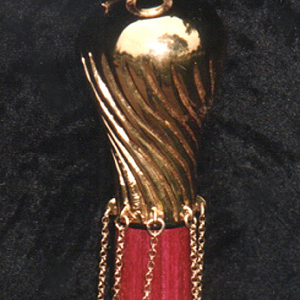 The cane head is solid bronze with gold plate. Onyx eyes in the snake. The cup has the crest of the school on it's side. Cane shaft is black lacquered maple. Pharmacy Cane 2 is not available for sale. This is an example of custom, limited-edition design. A custom one of a kind cane created for a client in Las Vegas. We worked hard to create a beautiful design that is pleasing to the eye and still fits comfortably in the hand. We also wanted to stay within the laws of physics as to what is possible for the human body. The steel pole adds strength to the overall design, it continues down into the wooden shaft of the cane. Pole Dancer Cane is not available for sale. This is an example of custom, limited-edition design. A cane designed and constructed for the entertainer Prince. Clear lexan shaft with gold plated fittings. Prince Cane is not available for sale. This is an example of custom, limited-edition design. A cane designed for the entertainer Prince. A simple swirling ball with symbol on top. Small medallions with symbol on them hang from chains around the base. Has a nice sound and movement. Plated in 24K gold on a pink Dymondwood shaft. Prince Medallion Cane is not available for sale. This is an example of custom, limited-edition design. A cane designed for the entertainer Prince. three music notes stacked on top of each other, each note has symbol on it. Plated in 24K gold on pink Dymondwood. Prince Music Cane is not available for sale. This is an example of custom, limited-edition design. Rocket Cane is not available for sale. This is an example of custom, limited-edition design. Designed by Guillermo del Toro, sculpted by his studio and made into reality by our shop. The silver cane sword used in the FX series "The Strain". Bronze head and tip with silver plating. Spring clip button releases a 28" long A2 carbon steel blade. Simple black wooden shaft. 5 different versions were created for use in the series. This cane is copyrighted by the studio and is NOT FOR SALE. Setrakian's Sword Cane is not available for sale. This is an example of custom, limited-edition design. A cane custom designed for a customer. 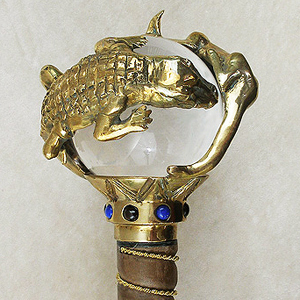 The cane has elements from several different movie props. Head is solid bronze with an antique silver plating and garnet eyes. Shaft is dyed and lacquered oak with matching bronze and silver tip. Werewolf Cane Custom is not available for sale. This is an example of custom, limited-edition design. 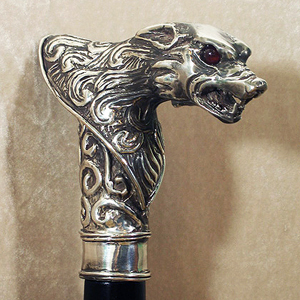 A wolf cane we created for use in the BBC America/Cinielix TV show "Copper". 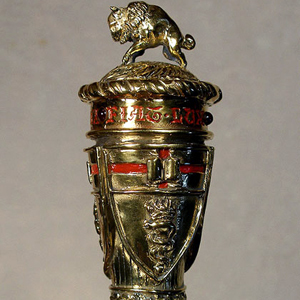 It is antiqued silver plated bronze, on a black walnut shaft with an imitation ivory band around the base. The band has a Chinese dragon hand carved into it and aged to look older. 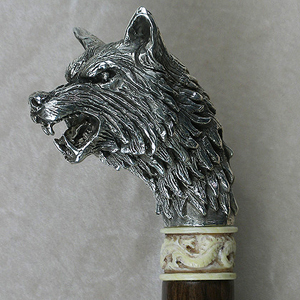 Wolf Cane (Custom) is not available for sale. This is an example of custom, limited-edition design.